Home gardeners know that organic gardening means a lot of work to eliminate weeds, unless you use these three natural ingredients. When you put as much time and effort into your garden as most home gardeners do, you want your vegetable beds to look fantastic. A weed can be any plant that is growing where you don’t want it to, so that variety of plants can make it difficult to find a natural weed killer that is effective. Weeds are an inevitable part of gardening. If you use manure for your garden, you are unfortunately introducing hundreds of weed seeds that passed through the cow’s digestive system before becoming your manure. Weed seeds can also come from bird droppings so you can see how they are nearly impossible to prevent. Organic is the healthiest way to go with your natural garden of course, and you may have tried some other ways to naturally eliminate weeds. Pulling weeds is always the most natural method, but it can become very labor-intensive depending on your garden size. Weeds, and all plants, have very resilient seeds that have developed the best way to ensure the survival of the species. Some seeds can lie dormant in the soil and wait for years until soil nutrient and moisture conditions are just right to sprout. In nature, on wild, uncultivated land, weeds are helpful to other plants. They add nutrients to the soil, shade and cool the soil, and they aerate the ground as their roots break up hard packed dirt. In garden beds, when we are providing ideal soil conditions for plants to thrive and produce by adding nutrient fertilizers, weeds can easily take over a garden. You may recall from our article Bees Make a Resurgence in Europe After They Ban This ONE Thing that the world bee population is in danger. Allowing some weeds to grow, like dandelions, provides flowers for bees. Bees will be important to your organic garden when your plants begin to flower and produce. Dandelions are one beneficial weed that you might consider keeping in your garden. Dandelion greens have a sharp flavor but excellent nutrition. According to motherearthnews.com dandelions have ‘protein, calcium, phosphorus, iron, riboflavin, niacin, and vitamins A and C and B1.’ Try them mixed in your salad with vinaigrette dressing. In a study of the use of vinegar as a natural herbicide, researchers found that a 9% concentration of vinegar could kill the weed hairy vetch. Researchers mention in the study that vinegar is very effective at killing plants, both wanted and unwanted. Another research study on the use of vinegar as a weed killer found that adding clove oil to the vinegar could help. Researchers say ‘Broadcast applications of vinegar and clove oil have potential for use on young, actively growing sweet corn, onion, and potato [crops].’ The use of vinegar as a weed killer is most beneficial when the weeds are small in size and more vulnerable to damage. This means that you will need to be very careful about spraying the weed control solution on your crops. The vinegar is basically a mild acid and it will burn the leaves of the weeds. The salt in the solution also creates a dehydrating condition for the leaves of the weeds. The dish soap in this solution acts to help coat the leaves of the weeds that you want to eliminate. 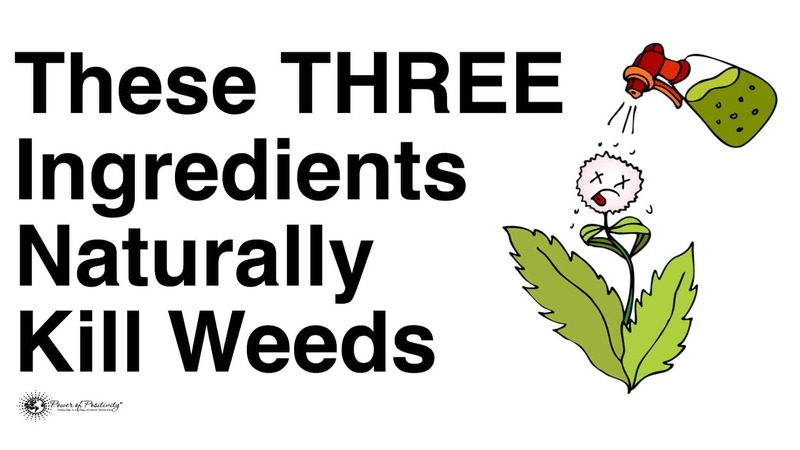 After you try this three ingredient way to eliminate weeds and you still think that pulling or raking is the best for your garden, this is also a suggested method by many. It is suggested to rake the areas around your plants every 10 days after planting your crops. By constantly disturbing this soil, the weed seeds that do germinate will be unable to keep growing. Tiny seedlings will be pulled up and turned under the surface of the soil where they will decompose and enhance the nutrients of the dirt.